Luke 19:29-40 When Jesus had come near…the place called the Mount of Olives, he sent two of the disciples, saying, “Go into the village ahead of you, and as you enter it you will find tied there a colt that has never been ridden. Untie it and bring it here. If anyone asks you, ‘Why are you untying it?’ just say this, ‘The Lord needs it.’” So those who were sent departed and found it as he had told them. Luke is the only one who tells us this odd little story about Jesus’ odd claim to the Pharisees in this raucous Palm Sunday crowd. Jesus made quite a few odd claims, didn’t he? Luke’s entire Jesus story is filled with them. It’s an odd, upside down way of looking at the world. It’s an odd, inside out way of living in the world. But that was Jesus’ way, wasn’t it? For example, this story of this triumphal entry into Jerusalem is itself an odd, upside down, inside out event. There is no other recording of Jesus ever riding on the back of an animal except here. 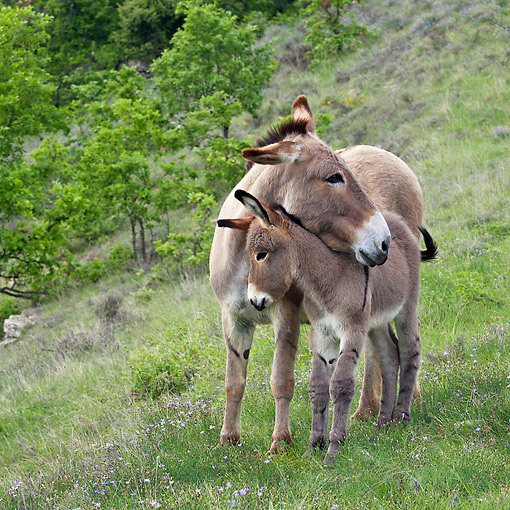 Even though we love our Christmas card pictures of the Holy Family traveling with a gentle donkey, still that scene is not described in any of the gospel stories. As far was we know, Jesus walked everywhere; except when he boarded a boat on the Sea of Galilee. But here, in this story, Jesus is very intentional about choosing a donkey to ride through the impressive gates of Jerusalem; a colt to ride through the crowded streets of Jerusalem. Triumphant entries happened fairly often in the cities of the Roman Empire. Conquering heroes astride prancing white horses would orchestrate their entrances so as to gain the most attention from the people. Enough adoration from the common folk would hopefully get the attention of the elite power brokers in the city. And so pomp and circumstance, glittering swords and rich brocades, stern soldiers marching ahead and behind announced how important they were. And the people would cheer and praise, happy for the spontaneous celebration that brought a welcomed break from their regular routine. But now, here, this was different. A poor rabbi, not a conquering hero. Simple disciples, not hardened soldiers. The colt of a donkey, not an elegant steed. Even so – the crowds cheered as if he were a king. “Blessed is the king who comes in the name of the Lord!” was their shout. This is treason, you know. Their bold clamor turns their allegiance to Rome on its head. Jesus is my King and Herod is not. God is my Lord and Caesar is not. The kingdom of heaven is coming and this iron-fisted Empire will soon be passing away. And Jesus didn’t even stop them. Didn’t disagree with their claim. Today is the day for bold confessions, for loud hosannas, for unmistakable counter-claims to the claims of every earthly empire. Because this simple man on the colt of a donkey is King of kings. This humble rabbi with the upside down view of the world is Lord of lords. And if we people don’t see it, recognize it, name it and proclaim it, then Jesus tells us: the stones will shout it out. In every age – not just in Jesus’ day and not just in ours – in every age there have been alternative worldviews. In every age, people have to decide: what is True? What is Right? Which way of seeing ourselves and the world is Real? Is the haughty hero on the prancing white steed real? Or is the humble rabbi on the colt of a donkey real? I have to say: both. Within our human family, there is a pervasive reality of self-centeredness, self-promotion, self-protection. I’m afraid “selfish” is who we are at some core of being – within ourselves as individuals, within ourselves as groups. We look out for ourselves and for our tribes, for the people who are most like us. We protect ourselves and isolate ourselves from people who are most “other.” It’s as if this is part of our human DNA. Of course people are good too; lots of people do good. Religious and non-religious people alike can be kind and honest and generous. But there is a deep way of being truly human that we yearn for but never can quite manage. Let’s face it – not many of us really want to pray for our enemies, or love those who persecute us, or deny ourselves, or take up our cross. But this is the humanity Jesus demonstrated to us. This is the alternative reality Jesus brought to us. And that’s the upside down, right side up character-nature-behavior of all people who become truly human by the grace and the gift of the Truly Human Truly Divine One. I think about the raucous crowds shouting hosannas to Jesus on that long ago Sunday. And I wonder how many of those people joined the crowds to shout for crucifixion on that fateful Friday. And I ponder how many of us might have joined them too. It’s easy for me to say I would never have betrayed Jesus back in the day. But how often do I resist taking up my own cross to follow him in some way or another every single day? Maybe one of the problems of our troubled society in these troubled times is that more of us need to be crying out for the upside down, inside out, right side up ethic that Jesus lived. Maybe more of us need to cry out for justice and equity and peace and compassion. Maybe more of us need to become truly human. Maybe more of us need to become the truly good news of Jesus Christ. Do we dare keep our silence hoping the stones will cry out in our stead? 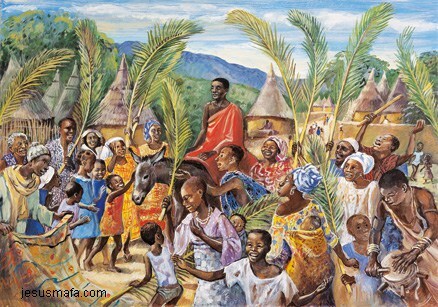 Some years ago, a good friend of mine offered the stewardship invitation at his church one Palm Sunday. He told the story again of the disciples borrowing the donkey from the family in the village outside Jerusalem. Even if the owners were reluctant to send their young colt off with people they didn’t know, they took the risk and allowed their donkey to be taken anyway. What if the owners had said “no”? I’m pretty sure Jesus would have found another donkey. But see how these people would have missed out on sharing in that upside down and inside out good news Jesus was bringing into the world. We can be silent. We can be safe. We can even let our hearts turn stone cold. But then God will find others to proclaim the hosannas and participate in the gospel. And it’s we who will miss the blessing. This is Holy Week. We move from remembering the triumphal entry today to remembering the last supper on Thursday and then recalling the crucifixion on Friday. It truly is holy time, a sacred space in our over filled calendars. I hope you will take time this week to remember the passion before we get to the party on Easter morning. So I will just leave you with this, with Luke’s words in chapter 23. Now Joseph of Arimathea went to Pilate and asked for the body of Jesus. Then he took the body down from the cross, wrapped it in a linen cloth, and laid it in a rock-hewn tomb where no one had ever been laid. 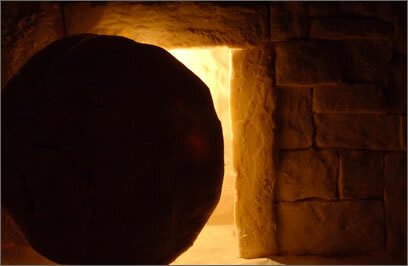 And a stone was rolled over the opening of the tomb. THAT stone will surely cry out.